Wisdom teeth extractions are a common treatment. The in-office oral surgery procedure removes your impacted or misaligned teeth. 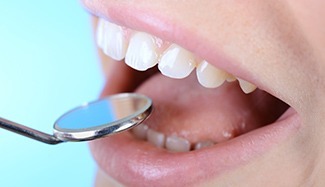 Extracting your wisdom teeth helps preserve the health of your surrounding teeth. Tooth development issues for younger patients can be avoided as well. Improper or crooked tooth growth can cause ongoing pain at the tooth location and within your gums and jawbone. Wisdom teeth extractions can eliminate your mouth pain at the source and within adjoining areas. Any anxiety you feel about tooth extraction is understood. Talk to your dentist about the procedure, your anesthetic options (including sedation dentistry), and the recovery process. Schedule a consultation with your Palm Beach Gardens dentist, Dr. Alvarez, to discuss your wisdom teeth growth and wisdom teeth extraction procedures. Dr Alvarez understands that this procedure is associate with a limited amount of pain. We at Natural Smiles take the utmost care to see that this procedure goes as smoothly and quickly as possible with the least amount of pain.